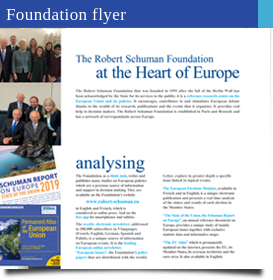 The Robert Schuman Foundation is established in Paris and Brussels and is a venue for research in an open, multinational network. The Foundation, which is a centre renowned for its research on the European Union, has provided itself with the task of maintaining the spirit and inspiration of one of the "Founder Fathers" of Europe, namely Robert Schuman and of promoting European values and ideals both within the Union's frontiers as well as beyond. The weekly electronic newsletter (Subscribe to the newsletter), addressed to over 200,000 subscribers in 5 languages (French, English, German, Spanish and Polish), is a unique source of information on European events. With each letter the Foundation publishes a study entitled European Issues, a strategic paper that looks further into an issue of public interest, or a European Interview, providing the views of leading personalities on a topical subject. The European Elections Monitor, available in French and in English, is a unique electronic publication and presents a real time analysis of the stakes and results of each election in all the countries of Europe. "The State of the Union, the Schuman Report on Europe", annual reference book on Europe, provides a unique study about the mainly European issues together with statistic and exclusive maps. The Foundation’s independence enables it to address all topical European issues in depth and objectively. Its studies and analyses provide European decision makers with information, arguments and ideas which are appreciated for their use and scientific quality. With its publications the Foundation lends a European dimension to all the main issues of public interest. The "Notes" address topical themes or issues in public life from a European perspective. A study on "European opinion" is also published annually. The Foundation organises and participates in numerous European and international meetings and conferences develops research programmes in co-operation with university centres and think-tanks. The Foundation's presence in Brussels and its network of partners in the Member States allow it to provide venues for discussion, to exchange on and debate the future of Europe. The Foundation has increased its initiatives to promote the European democratic model forwards notably in the “neighbouring” States. Training sessions are organised regularly for young European decision makers. The Foundation supports the creation of European information centres and takes part in their work. It distributes reviews and publications of European interest in French language to many libraries and documentation centres. The Foundation is managed by a Bureau and a Board which decide the strategic lines to be followed; there is also a Scientific Council which decides on the guidelines for future work and which assesses these.